3-Arthur Isaac Richardson was born on 21 Nov 1885 in Deloraine, Tasmania and died on 23 Jul 1938 in Bracknell, Tasmania at age 52. Arthur married Evelyn Annie French, daughter of Rowland Robert French and Annie Elizabeth Briggs, on 16 Apr 1913 in Methodist Church, Hagley. Evelyn was born on 19 May 1889 in Ringarooma and died on 5 Jan 1978 at age 88. The family lived on the Osmaston Road where they had a farm in an area known as Paddy's Scrub. The family moved to the Front Place at Exton, on the eastern edge of the township — a farm now owned by Alan French. As Arthur grew up he worked with his father and brothers often helping the older brothers as they set up their farms. He worked with William at Parkham, and Clarence at Elizabeth Town. Later the family moved to "Lenna" at Hagley. In April, 1913 Arthur, now 27, married Evelyn Annie French at the Hagley Methodist Church.They continued farming at Lenna with Arthur's father and his brother, Victor. They grew grain crops and raised cattle, sheep and pigs. They had a Wallis tractor in the early 1920's and all kinds of farm machinery and equipment. There were a number of draught horses and light horses for the buggy and jinker before the early cars appeared. Lenna was well known at Bells Mart in Launceston for many years. Each week over a hundred pounds of dairy butter and about six dressed pigs were sent in to be bought by regular customers at. the top price. Both Arthur and Evelyn were keenly interested in the Methodist Church at Hagley and later at Bracknell where they took part in all church activities. Arthur and Evelyn and their four young children (two girls and twin boys) bought a farm at Bracknell known as Melrose in 1926. This farm, on the Oaks Road had 338 acres of good land, bordering the road and the Liffey River. The family continued to supply Bells Mart with dairy butter and dressed pork each week and grain crops were grown. Soon after coming to Bracknell, Arthur who had always been very interested in machinery, bought a steam engine and plant from Alf Bosworth. He set up as a contractor with two steam engines a drum, chaff-cutter and straw press. This involved employing about 20 men in the summer and autumn. He also took over a sawmill at Liffey. The Depression years 1929-35 brought many worries. Prices were very low, debts were difficult to collect and Arthur was always loth to put a man off work. His health began to fail under the strain. However with the valiant help of Evelyn, Gwen and the young boys Cyril and Ken the farm and contracting business was kept on. Arthur became seriously ill in 1928 and died in July of that year. The family sold the machinery after a few years but continued with the farm and paid off all the mortgage. 4-Gwen Evelyn Richardson was born on 26 Nov 1914 in Hagley, Tasmania. 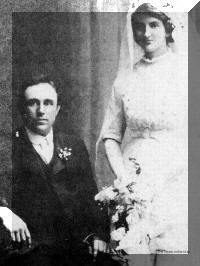 Gwen married Raynor Robert Denney on 22 Nov 1945 in Bracknell, Tasmania. Raynor was born on 5 Apr 1919 in Ulverstone, Tasmania, died on 5 Feb 2005 in Philip Oakden Hospice, Launceston at age 85, and was buried on 10 Feb 2005 in Ellesmere Cemetery, Scottsdale, Tasmania. He served in the Second World War. They had four children: Ewen Arthur, Neil Robert, Janice Eveleyn and Colin Richard. 5-Ewen Arthur Denney was born on 24 Mar 1947. Ewen married Susan Jane Medlicot. Susan was born on 16 Jul 1947. They had three children: Lisa Jane, Emma Kate and Guy Robert. 6-Lisa Jane Denney was born on 6 Apr 1971. 6-Emma Kate Denney was born on 6 Dec 1973. 6-Guy Robert Denney was born on 6 Jul 1977. 5-Neil Robert Denney was born on 8 Nov 1948. Neil married Leita Jean Waterworth. Leita was born on 9 Nov 1948. They had two children: Cristal Jean and Jodie Lee. 6-Cristal Jean Denney was born on 6 Jan 1972. 6-Jodie Lee Denney was born on 22 Oct 1973. Neil next married Judy Watson. Judy was born on 20 Sep 1950. They had one son: Mark. 6-Mark Denney was born on 22 May 1982. 5-Janice Eveleyn Denney was born on 30 Aug 1952. Janice married Glen Foster. Glen was born on 1 Sep 1952. They had three children: Samuel George, Illonna Eveleyn and Angela Jan.
6-Samuel George Foster was born on 28 Apr 1977. 6-Illonna Eveleyn Foster was born on 6 Nov 1978. 6-Angela Jan Foster was born on 23 Jan 1982. 5-Colin Richard Denney was born on 17 Feb 1957. Colin married Helen Louise Clark. Helen was born on 15 Nov 1956. 4-Minnie Irene Richardson was born on 9 Sep 1917 in Hagley, Tasmania. Minnie married Frank Hingston Howard, son of Frank David Howard and Linda May Byard. Frank was born on 13 Aug 1915 in Longford, Tasmania. They had six children: Heather Joy, Bevis Frank, Maxwell Arthur, Rex Alan, Donald Kenneth and Glen Adrian. 5-Heather Joy Howard was born on 4 Sep 1941. Heather married Lesley Down. Lesley was born on 17 Aug 1937. They had four children: Leanne Maree, Graeme John, Deborah Margaret and Christopher Andrew. 6-Leanne Maree Down was born on 8 Jan 1963. 6-Graeme John Down was born on 24 Mar 1965. 6-Deborah Margaret Down was born on 24 Mar 1965. 6-Christopher Andrew Down was born on 11 Jul 1969. 5-Bevis Frank Howard was born on 6 Mar 1943. Bevis married Clare Elizabeth Bennett. Clare was born on 16 Jul 1940. They had two children: Ruth Lynette and Lyne Andrea. 6-Ruth Lynette Howard was born on 5 Nov 1969. 6-Lyne Andrea Howard was born on 14 Dec 1971. 5-Maxwell Arthur Howard was born on 13 Aug 1944. 5-Rex Alan Howard was born on 28 Sep 1947. Rex married Dianne Binns. Dianne was born on 25 Jan 1943. They had five children: Christopher John, Michael Wayne, Stephen Mark, Louise Marie and Rebecca Ann. 6-Christopher John Howard was born on 10 Dec 1969. 6-Michael Wayne Howard was born on 22 Jul 1971. 6-Stephen Mark Howard was born on 13 Mar 1974. 6-Louise Marie Howard was born on 4 Mar 1976 and died on 13 Mar 1984 at age 8. 6-Rebecca Ann Howard was born on 10 Oct 1978. 5-Donald Kenneth Howard was born on 12 Mar 1951. Donald married Lynette Maree Rapsey. Lynette was born on 17 May 1949. They had two children: Peter Donald and Anthony Kenneth. 6-Peter Donald Howard was born on 22 Nov 1979 and died on 22 Nov 1979. 6-Anthony Kenneth Howard was born on 22 Jan 1981. 5-Glen Adrian Howard was born on 13 Sep 1954. Glen married Beverley Barker. Beverley was born on 4 Jun 1957. They had three children: Mathew Glen, Mark Jason and Abbie. 6-Mathew Glen Howard was born on 28 Nov 1974. 6-Mark Jason Howard was born on 27 Sep 1977. 6-Abbie Howard was born on 26 Apr 1985. 4-Cyril Arthur Richardson was born on 26 May 1921 and died on 24 Aug 2005 in Toosey Memorial Hospital, Longford, Tasmania at age 84. Cyril married Ethel Joyce Howard. Ethel was born on 26 Dec 1920. Another name for Ethel is Joy. They had three children: Lesley Joy, Barbara May and David Arthur. 5-Lesley Joy Richardson was born on 26 May 1945. Lesley married Elwyn Mullins. Elwyn was born on 27 Jan 1942. They had two children: Dearne Maree and Kim Louise. 6-Dearne Maree Mullins was born on 12 Jul 1965. Dearne married Craig Allan Carey. Craig was born on 8 Jan 1965. 6-Kim Louise Mullins was born on 27 May 1967. Kim married Michael Douglas Shelton. Michael was born on 7 Nov 1966. They had one son: Aiden Michael. 7-Aiden Michael Shelton was born on 10 Mar 1988. 5-Barbara May Richardson was born on 26 May 1945. Barbara married Alistair Colin Smith. Alistair was born on 30 Mar 1943. They had two children: Selina Ann and Paul Richard. 6-Selina Ann Smith was born on 2 Jan 1967. Selina married John Leonard Pitt. John was born on 15 Nov 1963. 6-Paul Richard Smith was born on 28 Jan 1969. Paul married Julie-Anne. 5-David Arthur Richardson was born on 8 Apr 1949. David married Beverley Ray. Beverley was born on 7 Apr 1951. They had five children: Kylie, Mathew, Linda Evelyn, Olivia Grace and Adam Luke. 6-Kylie Richardson was born on 12 Jan 1972. 6-Mathew Richardson was born on 8 Mar 1974. 6-Linda Evelyn Richardson was born on 13 Nov 1981. 6-Olivia Grace Richardson was born on 1 Nov 1983. 6-Adam Luke Richardson was born on 26 May 1986. 4-Kenneth Roland Richardson was born on 26 May 1921. He served in the Second World War. Kenneth married Doris Winfred Davis. Doris was born on 8 Apr 1921. They had four children: Carlene Doris, Jillian May, Maurice Kenneth and Craig Alan. 5-Carlene Doris Richardson was born on 24 Aug 1946. Carlene married Geoffrey Youl. They had two children: Nicole and Gavin. 6-Nicole Youl was born on 16 Aug 1969. 6-Gavin Youl was born on 25 Aug 1973. 5-Jillian May Richardson was born on 21 Nov 1948. Jillian married David Gilchrist. They had two children: Aaron David and Ryan Richardson. 6-Aaron David Gilchrist was born on 8 May 1974. 6-Ryan Richardson Gilchrist was born on 28 Jun 1977. Ryan married Andrea Ferrarotto. They had one son: Ethan James. 7-Ethan James Gilchrist was born on 9 Sep 2006. 5-Maurice Kenneth Richardson was born on 25 Feb 1955. Maurice married Christine Lawler. They had three children: Bethany Jane, Leigh John and Kyle James. 6-Bethany Jane Richardson was born on 31 May 1980. 6-Leigh John Richardson was born on 26 Mar 1982. 6-Kyle James Richardson was born on 9 Sep 1985. 5-Craig Alan Richardson was born on 16 Aug 1961. Craig married Caroline Morris. They had one son: Owen Qing Sheng. 6-Owen Qing Sheng Richardson was born on 25 Sep 2009.